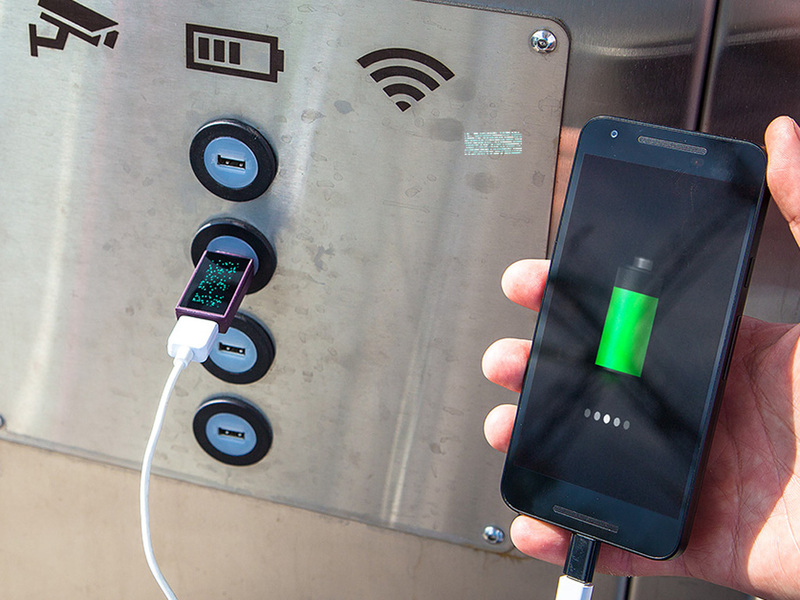 Charging your mobile devices in public places risks some of your data to be exposed. Users who are always on the road or spend a lot of time away from sockets at home or in the office have a solution, introducing the Pure.Charger. But first, let us remind you what could go wrong using a public USB port in an airport or café. The thing is, you’re seeing only the USB port, and it might be a nice, safe ordinary USB power adapter plugged into a 220V outlet. But there might well be a full-fledged computer on the other end. If it’s a computer port, your device will feed it some data. What next? Well, someone on the other end might get additional privileges on your device, steal data, infect your phone, or modify its firmware. We did some research to shed a lot more light on this issue. But does that mean public chargers should be banned? Unfortunately, you’re not always in a position to refuse when there’s a need. That’s why we created Pure.Charger. 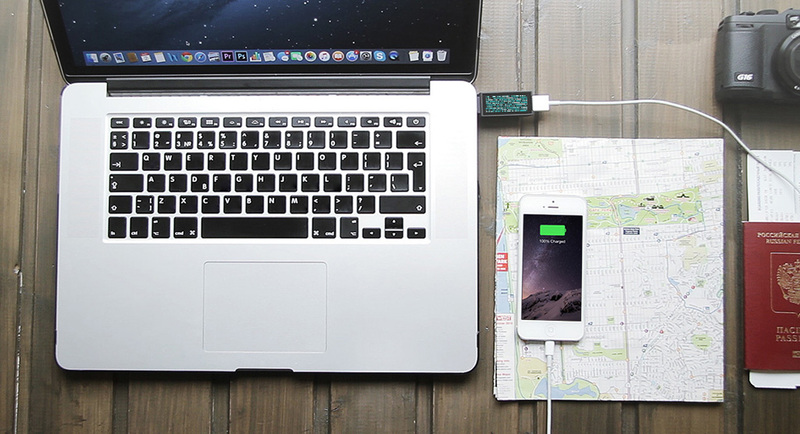 Pure.Charger is a compact, thumb-drive-size USB device. The gadget has a USB input on one end and a USB output on the other. It has a touch screen on top, and you use that to interact with the device — to activate or deactivate USB data lines. By default only the power lines are active, and no data is transferred. If a USB port requests a connection to transfer data, the device alerts the user, who can opt in to or out of the data exchange with a single tap. Also, Pure.Charger has a voltage stabilizer for surge protection: Should there be a spike of voltage, Pure.Charger will protect your smartphones’ hardware, event at the cost of its own life. Users won’t necessarily need to remember to plug the device in, either: Pure.Charger is so compact that it’s perfectly suited to remain permanently connected to the cable. You might wonder, why does this device need an app? Well, Pure.Charger has more jokers up its sleeve. This tiny, thumb-drive-style gadget is equipped with a fully functional processor, RAM, and flash storage, as well as a Bluetooth module for wireless connection with your smartphone. After you install the Pure.Charger app on your smartphone, you can track the charging process and get some insights like duration of charging, location, percentage of the battery filled up. Among other things, it helps you track your smartphone’s battery health. There’s also a loyalty program based on those stats. Every time you charge your device, you get bonus points, and as the user community grows, those points could be exchanged for goods in the in-app store — like flight miles, Kaspersky Lab’s or partners’ products. You charge your smartphone, you receive points, you get free security solutions in return. Sleek! At some point, the Pure.Charger SDK might become publicly available to the developer community, giving users the opportunity to enhance or modify its functions. In essence, our gadget is no different than wearables: It has a screen, a processor, memory, and connectivity modules as well. And, of course, if a gadget looks like a USB thumb drive, it might as well contain an actual thumb drive, so we offer Pure.Charger versions with built-in 16GB or 32GB flash drives. The capacity defines the price, $40 and $50, respectively; for those who don’t need the flash drive, the basic version is $30. Cool. Where do I get one? We published this blog post today for a reason: our crowdfunding campaign, aimed at collecting money to bring Pure.Charger to the mass market, has just started on Kickstarter. Three hundred early birds will get $5 off, so the basic version would cost them just $25. If you want to charge your devices securely and safely, please support our campaign. Following a successful Kickstarter campaign, we will upgrade and improve the Pure.Charger. For example, we have plans to make an even more compact version, and to launch an even more affordable one. We have a lot of plans, and we hope you will contribute your ideas as well! We think of the first version of Pure.Charger as sort of an experiment. We look forward to users’ feedback on how we can improve it, add more functions, or change its looks.